It's gotten easy to assume battery storage will become utilities' tool of choice for tackling peak capacity and frequency regulation. The technology has proved itself capable in PJM's Reg D market. And more recently, Southern California turned to storage for rapidly deployed peak capacity assistance following the massive Aliso Canyon gas leak. A growing litany of storage providers claim they can beat a new gas peaker plant on price, and are warning about the risks of stranded assets if utilities invest in single-purpose, low-utilization gas peakers instead. The economic case against new peakers grows more compelling as battery storage costs come down. But that argument doesn't work against another source of competition. Digitally assisted, flexible gas plants can handle both peak power and grid stability, calling into question the need for lithium-ion in those roles, said Niloy Sanyal, chief marketing officer for GE Power Digital, in an interview at the company's San Ramon campus. GE has been at work layering software over complex industrial operations with its Predix platform. Its asset performance management system digitizes every energy resource in a customer's fleet -- coal plants, gas plants, wind turbines, solar arrays, wires -- and allows real-time operational decisions based on crunching more data points than a human operator ever could. That means, among other things, the ability to control an existing gas plant based on system-wide fluctuations in supply and demand or grid stability (First Solar has proven that smart solar plants can handle power quality for the grid as well). Advanced batteries boast a near-instantaneous response time, giving them a leg up on gas plants, which need several minutes to fire up. But, Sanyal said, that shouldn't make much of a difference in practice. "Five seconds is too late," he said. "With the right software solution, you will know long before. [...] If you have that kind of flexibility in terms of prediction, a gas plant can cover that." The U.S. and Europe, Sanyal noted, already have considerable gas plant infrastructure that isn't running all the time. As renewable penetration has increased in places like Germany, the gas fleet plays the role of flexible balancing agent, firing up quickly when solar and wind production dips. Equipping them to act like virtual batteries would allow the utility to manage the transition to a more renewable-heavy grid without purchasing as many expensive battery solutions. That outcome, though, depends on a utility's regulatory incentives. "If you're incentivized to buy stuff, because you're a regulated utility and you want to go make a rate case, you're going to be more incentivized to chase a battery," he said. That's a critique one often hears battery companies apply to new gas infrastructure, but evidently the "buying things you don't really need" argument can go both ways. For this "digital battery" vision to work, the utility needs fleetwide digital control hooked up to a closed-loop control system for the gas plant. "It cannot be phone calls between the trader or the RTO/ISO and the dispatcher -- it needs to be an automated signaling," Sanyal noted. That's already underway with certain clients like Exelon and EDF, he said. This is not to say utility-scale batteries have no place on the grid; Sanyal readily acknowledges that they serve different needs in different regions. Island grids like Hawaii have a strong need for them to hold the growing solar generation for evening use. And he thinks batteries have a very promising outlook at the grid edge, sited among prosumers. If a specific region does need extra capacity delivered quickly, the utility can add storage to an existing gas plant. The storage covers the instantaneous response as the gas generator kicks in for the longer haul, preserving the health of the generator over the long run. 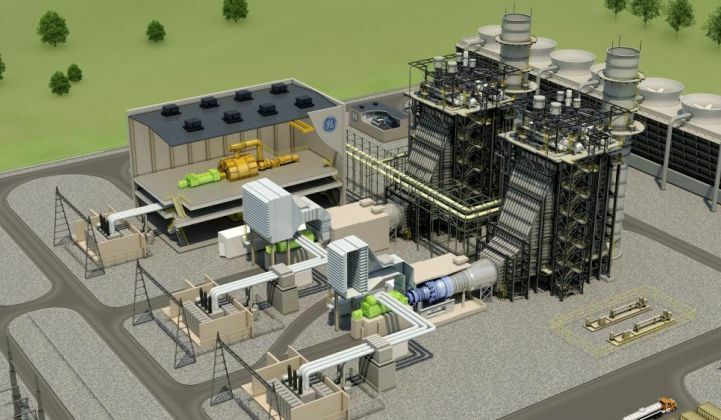 GE completed its first two integrated gas-plant-plus-storage projects earlier this year for Southern California Edison. The company later announced it would offer battery integrations not just for its gas generators, but wind, solar and hydroelectric, too. Utilities are unlikely to stop buying storage -- they're just getting started. Digitizing an entire fleet is lengthy and expensive, but storage deployments are increasingly quick and easy. As both technologies expand, though, they could come into competition. Storage vendors may need to work harder to differentiate themselves from these more nimbly operated gas plants. In jurisdictions aiming for 100 percent renewable power, the distinction is clear. In most grids with a less absolute clean energy goal, gas power has played a crucial role both in displacing dirtier coal plants and in balancing the intermittent renewable generation. As long as those plants persist, storage will have to fight for the honor of hunting the duck curve.